Observed mortality is the actual number of inpatient deaths that occur in the hospital during a specific period. Expected mortality is the predicted number of deaths in the hospital based on the patients’ levels of illness at the hospital. Patients who are very sick (higher severity of illness) have a higher expected mortality rate. A mortality ratio of 1.0 means the observed mortality equals the expected mortality for this patient population. A ratio of less than 1.0 means that fewer patients died than expected based on the performance of other hospitals as adjusted for patients with the same types and severity of medical problems. Mortality Index data for Emory University Hospital and Emory University Hospital Midtown are generated using UHC 2014 Risk Model for Academic Medical Centers while those for Emory Saint Joseph’s Hospital and Emory Johns Creek Hospital are generated using UHC 2014 Risk Model for Community Hospitals. Source: Vizient (formerly known as UHC) Database. Vizient is an alliance of 5,200 health system and their affiliated hospitals representing independent, community-based healthcare organizations, integrated systems and academic medical centers. Data below shows monthly performance from September 2013 through May 2016. Data is preliminary for the most recent quarter and therefore subject to change. 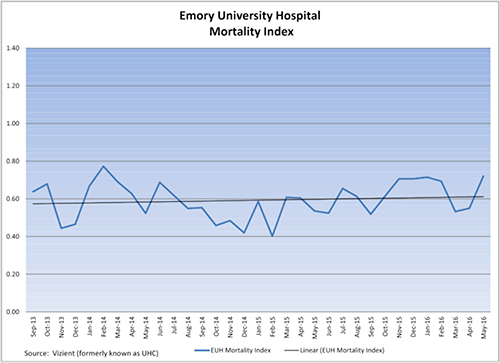 Emory University Hospital’s Mortality Index for FY16 YTD performance (August’15-May’16) is 0.64. 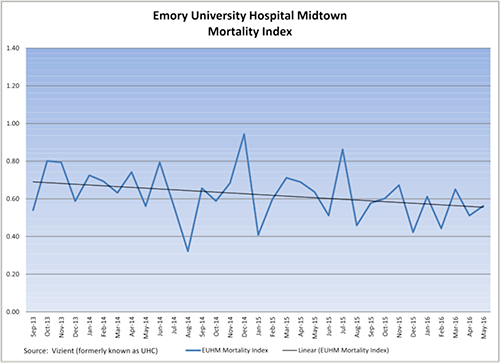 Emory University Hospital Midtown’s Mortality Index for FY16 YTD performance (August’15-May’16) is 0.55. 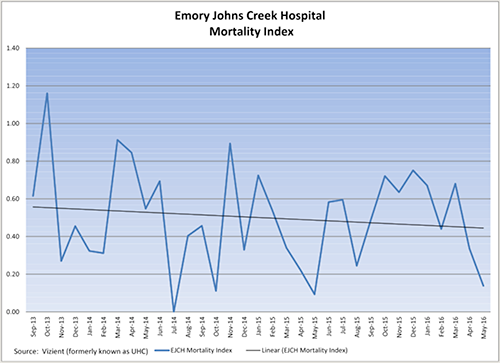 Emory Johns Creek Hospital Mortality Index for FY16 YTD performance (August’15-May’16) is 0.50. 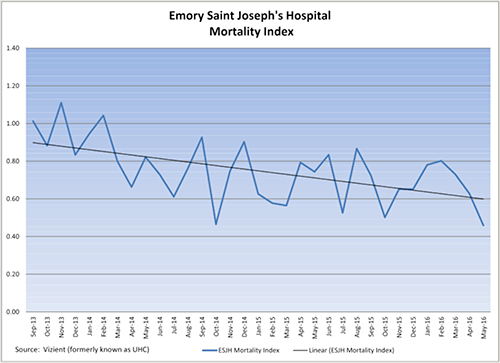 Emory Saint Joseph’s Hospital Mortality Index for FY16 YTD performance (August’15-May’16) is 0.67.